What’s better than Italian chicken sausage? Premio Italian Chicken Sausage with Cheese & Garlic, of course! This sausage, made with flavorful Romano and Parmesan cheeses and garlic, packs enough flavor to be put on a roll and savored all by itself. It could be a tasty addition to your next pasta dish or the star of meal centered on its mouth-watering flavors. Either way, this delicious sausage is ready to be the star of your next meal today! Find the Premio retailer closest to you, or order online now. Ingredients: Chicken, Less than 2% of the following: Salt, Parmesan and Romano Cheese (pasteurized cow’s milk, cheese culture, salt, enzymes), Dextrose, Vinegar, Lemon Juice Concentrate, Paprika, Dehydrated Garlic, Spices (including black pepper & anise), Dehydrated Parsley, Natural Flavors. Stuffed in Hog Casings. Using the best ingredients offers the key to any good meal, and you can’t go wrong when your meal starts with Italian chicken sausage flavored with cheese and garlic! The spicy-yet-sweet taste of the sausage melds with the tangy cheese and pungent garlic for an explosion of Italian flavors in your mouth. When you use this meat as the base for building your lunch or dinner, you’re guaranteed a meal you will remember. 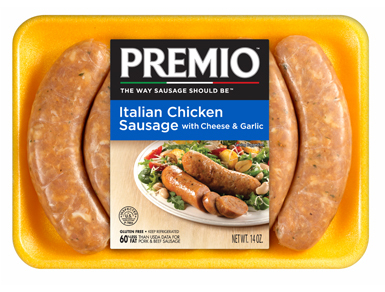 The best part about using Italian chicken sausage with cheese from Premio Foods? Our chicken sausage has 60% less fat than USDA data for pork & beef sausage. You do your heart a favor when you choose lower-fat options, protecting yourself from obesity and disease. It’s a smart way to enjoy the flavors you love without any of the added calories. You can choose from a large selection of chicken sausages when you order from Premio Foods. We know our customers love foods that taste good and are good for them. Packed with 13 grams of protein, our Italian chicken sausage with cheese and garlic will keep you satisfied for hours while also fulfilling your daily nutrient needs. A meal with our meat can fuel you through a workout later in the day or help you stay alert during a meeting. Our Fresh Sweet Italian Chicken sausage with Romano and parmesan cheese and garlic will guarantee a complete gourmet dining experience. For pasta lovers, try Premio Fresh Italian Chicken Sausage with Cheese and Garlic in a “Mediterranean Tortellini” or a “Pepper Sausage Shredded Pasta.” A delicious bacon wrapped bbq’ed sausage with sauerkraut or French fry sticks are sure to make your taste buds tingle! Why Buy Sausage From Premio Foods? You can see those commitments play out across our company. We use only the finest butcher-quality meat cuts in our sausages. We connect with our customers through fun recipe contests and by reaching out to see how they like our sausage. Each year, we give back to the community by donating to food drives and worthy charitable causes. And we treat our employees like part of the family. Often, they really are! We have also added healthy choices for our customers, such as our chicken and turkey sausage, to address their concerns. Many people want to live a healthier lifestyle. They understand the link between feeding our bodies the most nourishing food and seeing them thrive in return. Premio Foods is proud to help in that quest. You can purchase our chicken sausage directly from the website or you can use our store location tool to find a place near you that carries Premio Foods items.